The cost of construction machinery may continue to rise, due to the surging price of materials and increasing demand from infrastructure projects, industrial analysts said. In fact, they said, leading companies have already raised prices for loaders by 5 to 10 percent. 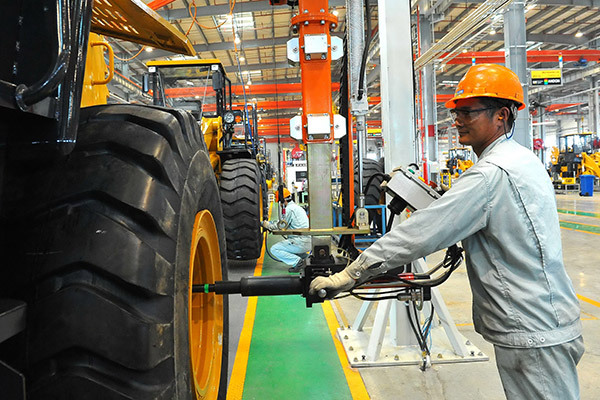 China’s leading heavy industrial equipment manufacturers, including Guangxi-based Liugong Machinery Co Ltd, Shandong-based Shantui Construction Machinery Co Ltd, and Jiangsu-based Xugong Group Construction Machinery Inc, have decided to lift the price on their loaders due to the rising cost of manufacturing materials such as steel, rubber, aluminum and iron castings. Wang Huajun, the senior analyst at Zhongtai Securities Co Ltd, said that the major push behind the price rise was the soaring cost of steel, which accounts for around a third of the entire cost of manufacturing heavy machinery. According to data from zh818.com, a national steel industry monitoring website, steel prices have doubled this year, from 2,000 yuan ($310) per metric ton to 4,000 yuan. According to Liugong’s notice to the retailers, Liugong will lift the price for its three-ton loaders and five-ton loaders by 10,000 yuan and 20,000 yuan respectively, starting in October. Shanti and Xugong also released similar notices recently, while Sany Heavy Industry Co, among the biggest companies by sales volume, hasn’t clarified if it will follow the same path. Wang said it was possible that a series of products such as cranes, tower cranes and excavators will also see a price rise to tackle the rising cost, which should result in the manufacturing companies seeing better performance in the second half of the year. Despite the rising cost and low stocks available, the sale performance of heavy machinery remains strong due to the increasing projects both home and abroad. According to a China Construction Machinery Association’s report, Chinese excavator manufacturers will see their sales soar by 50 percent in 2017 from the previous year. “A large percent of Sany’s overseas profit was generated in economies involved in the Belt and Road Initiative,” said Huang Luchuan, chief marketing officer of Irootech, the industrial cloud platform and solution provider.